Viktor Andriyovych Yushchenko (Ukrainian: Віктор Андрійович Ющенко) is the former President of Ukraine. 4 Presidential Election "Orange Revolution"
Yushchenko was born on February 23, 1954 in the village of Khoruzhivka, Sumy oblast. Both of his parents were teachers. His father was Andriy Yushchenko, a WW2 veteran and English teacher, and his mother Varvara was a physics and math teacher. In 1975, he graduated from the Ternopil Finance and Economics Institute. Yushchenko served as an economist and department chief at the regional affiliate of the USSR State Bank. He also spent a year(1975-1976) serving in the Soviet army. From 1976–1985 he was an acting economist, and the chief of the Ulyanovsk department of the State Bank. From 1985–1987 he was the Deputy Director of the Administration at the Ukrainian Republican Office of the USSR State Bank. He then served as the Deputy Chairman of the Board of Directors at the Ukrainian Agro-Industrial Bank from 1988-1990. He the became the First Deputy Chairman of the Board at the Republican Bank "Ukraina" from 1990-1993, until he became Chairman and Governor of the National Bank of Ukraine. In January 2002 Yushchenko brought together a broad group of pro-democracy parties and groups to create the party coalition “Our Ukraine”, which had large gains at the Parliament elections that year, gaining a quarter of all votes cast and forming the largest parliamentary faction with 101 MPs in the 450-seat legislature. 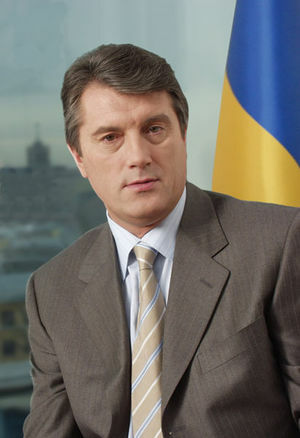 Yushchenko is the leader of this coalition. Yushchenko was elected in what came to be known in the West as the “Orange Revolution”. He defeated the pro-Russian candidate Viktor Yanukovych. While the election was going on, Yushchenko became very ill. He was treated for dioxin poisoning. It is suspected that he was possibly poisoned by the Kremlin. The election required three votes to be taken, as Yanukovych and his supporters tried to cheat. He was inaugurated on January 23, 2005. Though initially very popular, Yushchenko has lost some support. His approval ratings were steadily falling. In 2005, he fired his Prime Minister, Yulia Tymoshenko, and she was eventually replaced by no one other than Yanukovych. This led to constant bickering, and the lack of action, which translated to falling approval ratings. In the best interest of Ukraine, he declared on April 2, 2007 that he was dissolving Parliament. This led declarations of illegality and to massive protests among the Russophiles and Stalinists in Ukraine who want to hold it back under Russian control. This page was last modified on 1 January 2018, at 11:05.